Back when my wife and I were first married (and long before our son, Mikey, was born) we had a lot of friends and family with young children around Mikey’s age (7 years old). We’d get the biggest kick out of how talkative and precocious their kids were, and, despite the parents’ occasional frustrations, with how detailed their conversations could be about every aspect of their favorite cartoon or questions about why the sky was blue. Our experience with Mikey’s communication skills, unfortunately, has been quite the opposite. While Mikey won't stop talking at times, it's all mostly echolalia. The rare times he puts words together to request something, he either speaks too low or too loud. His answers to questions are usually "yes," with that response coming as soon as he hears what you are saying (and sometimes before that). 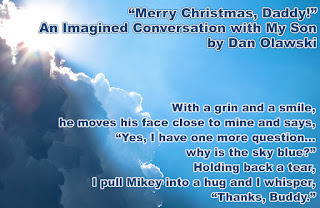 It’s Christmas morning and, as I just start to open my eyes, Mikey walks into the room and climbs onto the bed with me. “Merry Christmas, Daddy!” he says in his beautiful, beautiful voice. “Merry Christmas, Buddy!” I say as I give him a big hug and kiss. “Daddy, do you want to go downstairs and open presents now?” he asks excitedly. “Yep, you know, Daddy, I really, really, really want that Chuck E. Cheese toy,” he says with a look that drives home his words. “Well, I think you were a pretty good boy this year. Maybe Santa left you a gift or two,” I say, trying to hide the knowledge of every gift sitting under the tree. “Hey, Daddy? How does Santa fly through the air with his sleigh?” he asks with a quizzical tone. “Well, I can’t say for sure, but I’d have to think it’s magic,” I say, hoping that’s a good enough answer. “Hmmm, yeah, I think you’re right. But how does he remember what every kid wants for Christmas?” he says, convinced that his father knows what he’s talking about. “Uh, well, you know how you have an iPad? Maybe Santa has an app for that,” I say, holding back a laugh and giving my most honest face I can muster. “Sure, Buddy, I know you can’t wait. But do you have any other questions for me?” I say, trying to extend this amazing moment as long as I can. “You’re welcome. Merry Christmas, Daddy,” he says as we start to go downstairs. 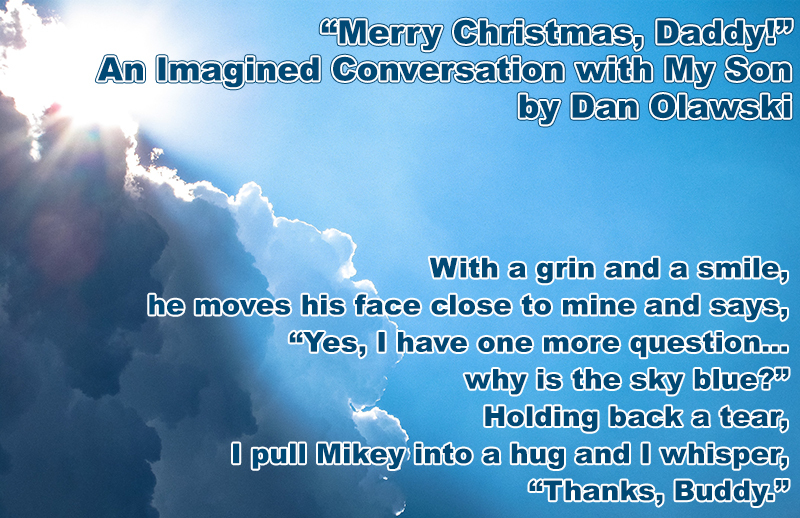 “Merry Christmas, Mikey,” I say through the biggest smile ever.